The Woodsmen Show celebrates the rich lumber history of Potter County. 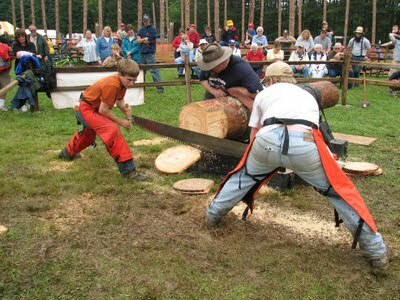 Come see the top lumberjacks in the country come to Cherry Springs State Park to compete in events like cross cut saw, springboard, axe throwing and tree felling – the same events featured in the popular outdoor games on TV. Witness ordinary people test their own skills while rubbing elbows with the pros. Watch talented chainsaw artists create works of beauty. Discover exhibits, vendors and historical re-enactments all commemorating our great forest and the life of the woodhick. After soaking in all the activities, sit down with a hearty meal and enjoy traditional music. Held at Cherry Springs State Park, Rt. 44, Potter County and sponsored by the Galeton Rotary Club. The three day weekend offers a bit of excitement for everyone. Every event has a connection to Potter County’s rich lumbering history.